This website takes its name from three regrettable situations now playing out in the Upper Clearwater Valley near Wells Gray Provincial Park – two hours north of Kamloops and six hours northeast of Vancouver. All trace directly to environmental deregulation by the former B.C. Liberal government during the past sixteen years, and all have lately been exacerbated by the forestry giant Canadian Forest Products, or CANFOR. Government complicity in the collapse of a uniquely Canadian Mountain Caribou herd – down by about two-thirds since the B.C. Liberals took office in 2001. Government betrayal of a 1999 formal land-use agreement called the Guiding Principles:, intended to strike a lasting balance among local stakeholders. Government and corporate hindrance of efforts to create a wilderness tourism economy in support of a small rural community now faced with an uncertain future. a. Its Mountain Caribou show definite signs of recovery. b. The Guiding Principles agreement is reinstated as a formal government objective. 2. To prevail upon the honourable Catherine McKenna, federal Minister of Environment and Climate Change, to adjudicate an emergency protection order under Canada’s Species at Risk Act that has been languishing in her office since early April. 3. 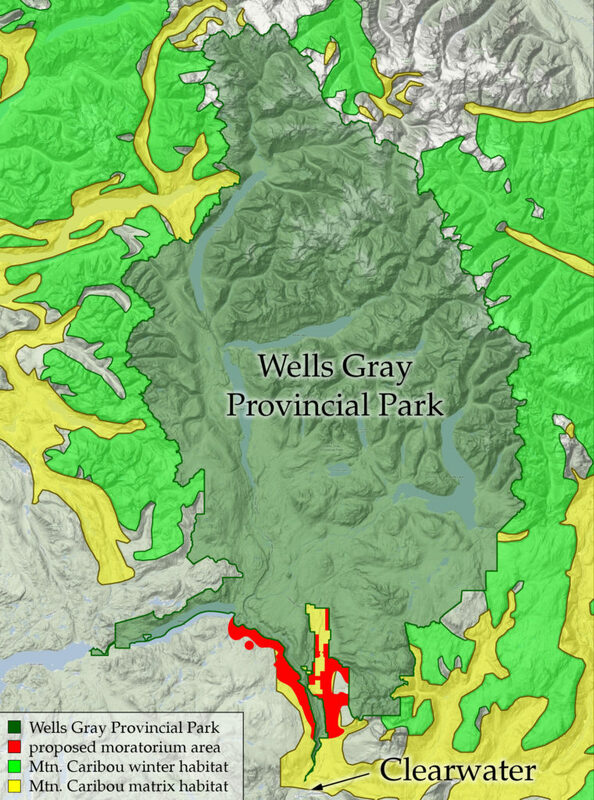 To persuade CANFOR to stand down from further logging within federally designated Critical Habitat for Caribou near Wells Gray Park -and so fulfill its public commitment to Species at Risk and, more generally, to its social licence. Click on any of the first seven tabs at top right to read a tale of intrigue, duplicity and betrayal by the former B.C. Liberal government and of heel dragging on the part of Canada’s current federal government – or else go directly to the juicy stuff here: letter to Premier Horgan, letter to CANFOR, letter to Catherine McKenna. Click on the eighth tab, Please Speak Out! to let premier Horgan know how you feel about 16 years of environmental deregulation under the B.C. Liberals – policies that punished the environment while hollowing out rural communities. Click on the final tab, The Rest of the Story, to read how the story of Canada’s intersection with the sixth global extinction has so far played out against a backdrop framed by corporate greed and seeming federal government indifference. The Upper Clearwater Referral Group is a citizen committee established in November 2000 by the (then) B.C. Ministry of Forests to ensure adherence to a formal, government-sponsored Local Use agreement called the Guiding Principles for the Management of Land and Resources in the Upper Clearwater Valley. In 2014, Canada’s federal government formally designated the proposed moratorium areas marked in yellow as Critical Habitat for Caribou under the Species at Risk Act. 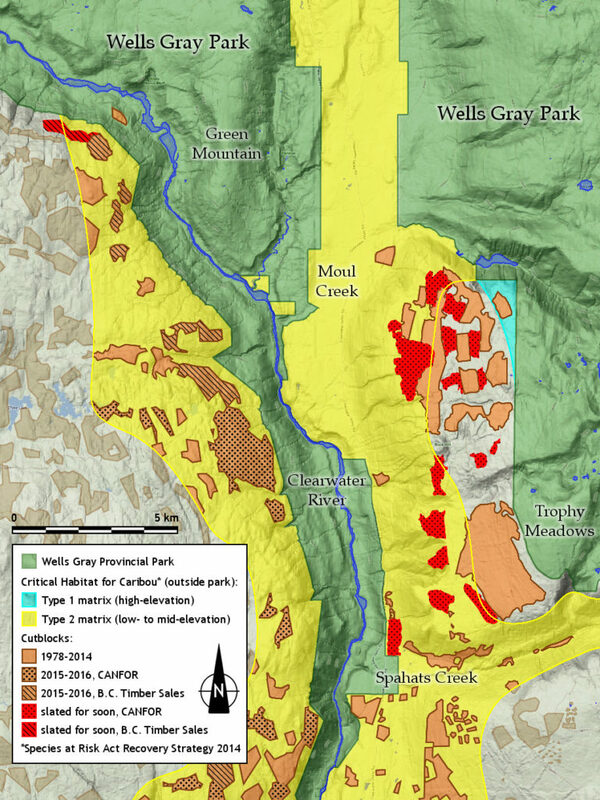 Surely it’s not too much to ask premier Horgan to establish a moratorium here on industrial logging until Wells Gray’s Mountain Caribou show definite signs of recovery. Meanwhile, the government should allocate part of the $27 million recently promised for caribou recovery to help the affected communities diversify their economic drivers. The hour is late for Canada’s Mountain Caribou. Please speak out while there’s still time.